Toastmasters Speeches: The Demonstration Talk-Sample Speech, "The Eggbeater Kick"
The Demonstration Talk-Sample Speech, "The Eggbeater Kick"
Good Evening! Who among you here have visited my personal blog? 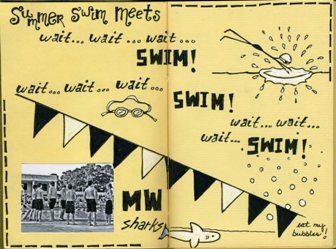 Those who have visited my blog would probably know by now that the blog is essentially a swimming journal. In my previous speeches, I’ve talked about blogs and blogging. And in my blog, I mentioned a windows gadget called a site statistics counter. This gadget tracks the organizations and IP addresses that visited my blog. It also shows what web pages the visitor entered as well as the search information that they were looking for. Did you know that 40 to 50 percent of my blog’s visitors were searching for information about a treading technique called Eggbeater kick? I’ve written some lengthy articles on the eggbeater kick complete with pictures and videos. What is an Eggbeater Kick? The Eggbeater Kick has nothing to do with Martial Arts! It is a treading technique to stay vertically afloat in deep water. Deep water for most of us is probably 6 feet or deeper. It is a very efficient treading technique compared to the flutter kick which is strenuous, or the frog kick which makes you bob up and down in the water. The reason many people don’t know about the eggbeater kick is because it’s done underwater. Those who do it are mostly lifeguards, synchronized swimming athletes and water polo players. Why is it called Eggbeater? Well, because it mimics the action of an eggbeater. 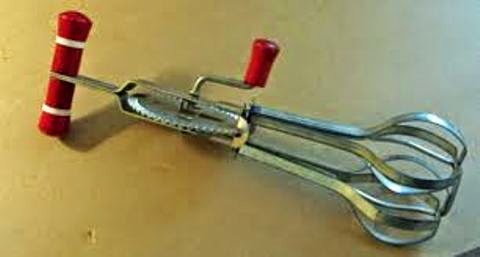 An eggbeater is a kitchen apparatus which looks like this (show picture of kitchen eggbeater). You hold the handle and turn the crank on the side.It has gears to turn two spindles that have mixing blades below. The blades then beat eggs or mix liquid ingredients together. The eggbeater kick imitates the turning of the two mixing blades. Let me show you. When you jump or drop into deep water, be sure your body is vertical. Take a big breath of air because when the lungs are full of air, it makes the body more buoyant in the water. The arms then start sculling the water with a figure-of-eight motion near the surface. You could imagine your arms to be a flexible bread knife, spreading peanut butter on a large piece of bread. So that’s the sculling of the arms. How about the legs? Well, here’s where the eggbeater comes in. The left leg will rotate clockwise while the right leg will rotate counterclockwise. Here’s how the right leg look like. Normally, if you’re looking downwards the foot and the knee and the hip are all aligned. To start an eggbeater kick, the foot is outside of the knee, like this. The knee is outside of the hip, like this. Then turn counterclockwise, like this. The foot will be sculling the water in a circular motion and it is this motion that creates lift, keeping you above water. This is much like the rotating blades of a helicopter lifts it upwards. Now for the left leg, it is similar, but the turn is clockwise, like this. Now, this is important. The legs do NOT turn at the same time like this, or this. No. Otherwise, both feet will hit each other. Or if you manage to even do it, you’ll be bobbing up and down. The legs should turn alternately like this. So the leg motion will appear like this. This motion will make your body more stable in the water. So that is how all the parts of the body work when you do the eggbeater kick to tread water. This is an underwater view of the eggbeater kick in slow motion. The person is good in the sense that she doesn’t even need to scull her arms – see? In fact (press to pause the video), you could even raise both arms out of the water. And when you do that you’ll sink a little and to counter that, you’d need to kick faster. So, there you are. The mysterious eggbeater technique for treading water – now revealed to you as I have written it in my swimming journal.